This is absolutely the best tour for seeing Denali (formerly Mt. McKinley) and other high peaks in Denali National Park and Preserve! You will begin your incredible flightseeing adventure in Talkeetna. As your plane lifts off the ground, you will begin to see how the last ice age has shaped the land. Enter a world of rugged high mountain peaks, wide glacier filled valleys, winding glacial rivers, deep crevices and azure melt pools. Your pilot-guide will take you within six miles of Denali’s summit then up close to Mt. Foraker and Mt. Hunter. Fly over the winding Kahiltna Glacier—the longest glacier in Denali National Park measured at 45 miles long and three miles wide. You will see the climber’s Base Camp located at 7,200 feet on the southeast fork of the Kahiltna Glacier. Descend into the Sheldon Amphitheater through the Great Gorge for your return back to Talkeetna. Maximum weight is 400 lbs. Tour is subject to cancellation due to inclement weather. Tour operates subject to meeting a minimum number of participants. Dress in warm layers. Bring a jacket, sunglasses and camera. Tour takes place in Talkeetna. Transportation to and from excursion provided by the Mt. McKinley Princess Wilderness Lodge Talkeetna Shuttle. 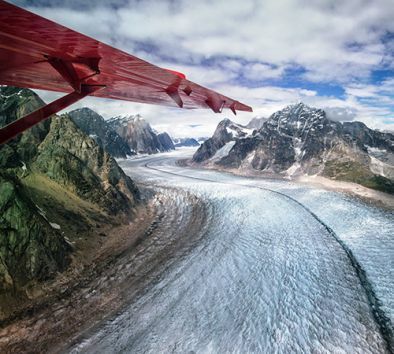 Flight time is approximately 1¼ hours with 30 minutes on the glacier.